•	Purifies pores, delicately draws dirt away, deep cleanses, stimulates blood circulation and leaves your skin soft, smooth, supple, clear and spot free. •	Reduces tanning effect on skin, darkness under the eye and improves overall complexion. PamoVia Mix Fruit Scrub is specially designed with organic botanical extract of Orange, Lemon, Strawberry, Mulberry, Papaya, Cucumber, Kiwi .It gently exfoliates the skin removing impurities and dirt from our skin leaving you refreshed and energized all day long . Ingredients : Aqua, Cetstearyl Alcohol , Stearic Acid, Paraffinum Liquidum, Glyceryl Monostreate , EDTA, ceteareth 20, Propyl Paraben, Sodium methyl paraben, Walnut Shell, Orange Extract, Lemon Extract ,Papaya Extract, Kiwi Extract, Strawberry extract, Mulberry Extract, Cucumber Extract, Perfume . •	Unique combination of multifruit enzymes that are natural moisturizers and good emollients. •	A formulation of powerful antioxidants that is essential in controlling free radical damage. PamoVia Mix Fruit Gel is specially formulated with organic botanical extract of orange, Lemon, Strawberry, Mulberry, Papaya, Cucumber and Kiwi . Being a powerful antioxidants, rich in Vitamins it is suitable for all skin types and is very effective fruit facial. Ingredients : Aqua, Propylene Glycol , Triethanolamine, EDTA, Sodium methyl Paraben, Carbomer, orange, Lemon, Strawberry, Mulberry, Kiwi ,Cucumber, Papaya Extract, Perfume . •	Hydrating mud pack imparts natural glow and makes skin beautiful, radiant, rejuvenating and moisturized. •	Removes dirt and dust from the upper layer of epidermis and purifies the skin. PamoVia Mix Fruit Face Pack Contains fruit extracts which is natural moisturizer and good emollient which protects the skin from dryness. Being rich in anti-oxidant it removes the dirt and dust from the upper layer of epidermis and purifies the skin. Multi fruit enzymes are excellent for total skin nourishment, skin complexion and for bright and radiant look . Ingrediens : Aqua, Cetstearyl Alcohol , Stearic Acid, Paraffinum Liquidum, Glyceryl Monostreate , EDTA, Propyl Paraben, Sodium methyl Paraben,Titanium Dioxide, Xanthan Gum, Bentonite, Kaolin, Multani Mitti, orange Powder, Lemon extract, Papaya extract , Kiwi extract, Strawberry extract, Mulberry extract , Cucumber extract , Perfume . Step 1: Take PamoVia Mix Fruit Facial Scrub and mix it with small amount of water on palm of hand. Massage Lightly onto the skin with a circular motion for 5-10 minutes. Rinse off with warm water. Facial Scrub remove dead skin cells, and dirt from the skins pores, which makes your skin smoother. 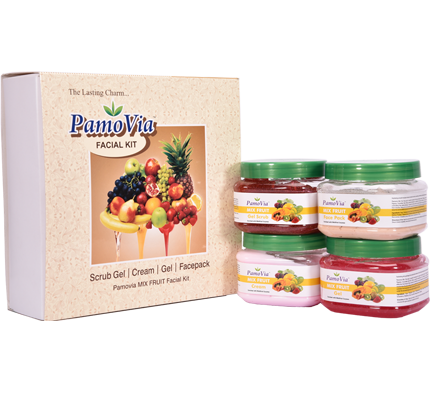 For oily skin use PamoVia Mix Fruit Facial Gel Scrub and for dry skin use PamoVia Mix Fruit Facial Cream Scrub. Step 3: After Facial Cleansing lightly apply PamoVia Mix Fruit Facial Massage Cream on your face . Moist hand and gently Massage for 5-10 minutes using upward and outward strokes. Leave for 5-10 Minutes and remove with damp cotton . Step 4: Apply PamoVia Mix Fruit Facial Gel evenly on entire face and neck avoiding eyes in upward circular motion . Leave for 3-5 Minutes till it gets absorbed completely into the skin for maximum moisturizing.